This Woody Allen quote is funny because it is true. Bettakultcha came about because Richard Michie and myself showed up to an unrelated event at Creative Networks and got chatting.Â I’m not sure how Imran Ali got involved with Ignite, nor how Jon Eland put together Exposure Leeds, or even how Phil Kirby got into bed with Temple Works, but one thing you can be sure of is that they all showed up someplace to talk to someone else about their idea. You start with a vision, then you convince people that this vision is worth pursuing. The photograph above, depicts the shaping of a vision. Currently, Leeds, has several events which involve short presentations using digital slides. Presenters volunteer their services on the night. as do the organisers. They have proven to be highly popular with the animated audiences. So, an opportunity presented itself. It could all be so much bigger, so much more involving. If we pooled all the available talent and expertise into organising and delivering a glittering evening of ideas and entertainment, a lot of fun could be had by a lot of people. It could even repay some of the volunteer work. 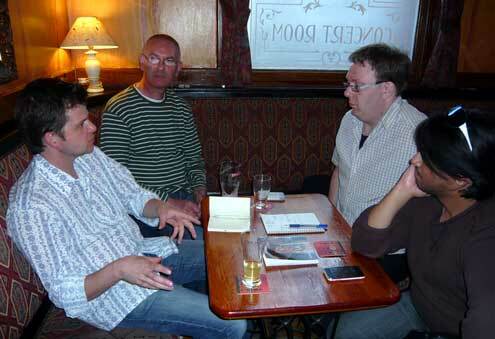 And so, one night this week, Richard Michie, Phil Kirby, Jon Eland, Imran Ali and myself, showed up to discuss the vision. This entry was posted on Thursday, June 17th, 2010 at 2:36 am	and is filed under General. You can follow any responses to this entry through the RSS 2.0 feed. You can leave a response, or trackback from your own site.